With sweeping beaches, lush rainforest and gin-clear rivers, this area has some of the most rugged scenery and interesting history Fiordland has to offer. View native birdlife and follow in the footsteps of intrepid early European settlers on a remote guided hike, stopping for a freshly prepared gourmet picnic lunch enroute. Then discover the famous Milford Sound and all its spectacular sights by helicopter, including Mitre Peak & Sutherland Falls. Land on one of the breath-taking glaciers for a once in a lifetime photo opportunity. Your return flight will take you along the Murchison Mountains, a special conservation area and home to the endangered Takahe, a flightless bird once thought instinct. Price: $10,200 NZD (incl GST) minimum of two people maximum of 4 people. 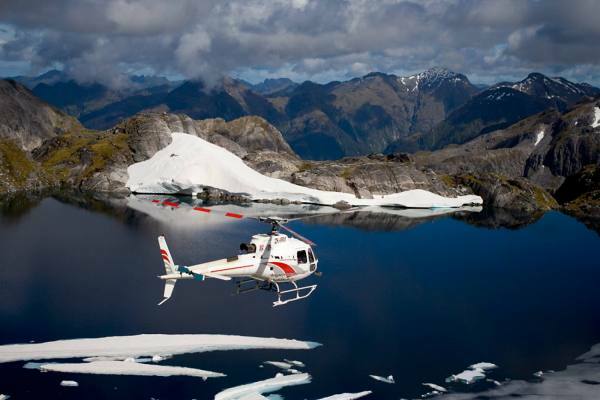 This sensational day out starts with a Milford Sound scenic helicopter flight. Land on the famous glacier, Mt Tutoko and enjoy breath-taking views. You will then fly across to the Central Otago Vineyard, Chard Farm, in Gibbston Valley where you will enjoy an exclusive wine tasting. Private transfer from Chard Farm to Wet Jacket winery where you can taste the full Wet Jacket range in a relaxed environment, with exceptionally personal touches. 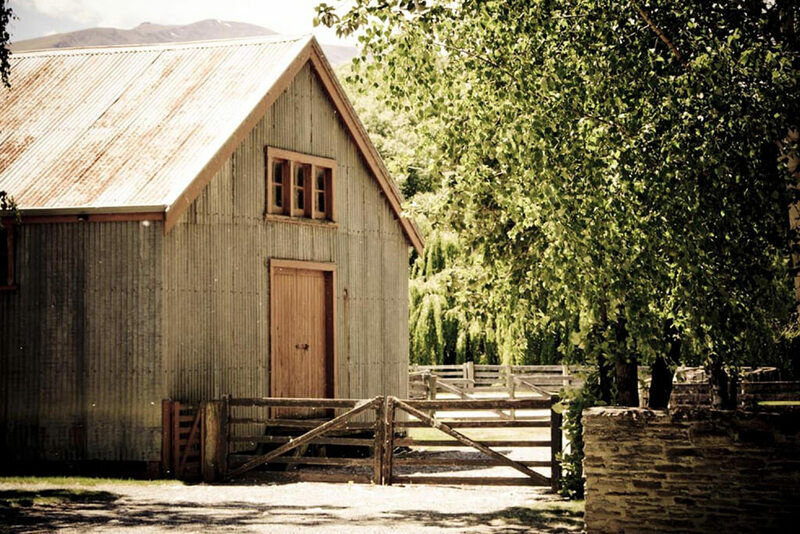 Step back in time to explore a real working woolshed from over 150 years ago. Price: $10,500 NZD (incl GST) minimum of two people maximum of 4 people. The "Sights of Stewart Island" day adventure provides a unique opportunity for clients of Fiordland Lodge to experience the very Southern point of New Zealand called Stewart Island Maori name “Rakiura”. You will be picked up from the Fiordland Lodge by helicopter at 10am. The flight will take you South to Rakiura where you will land on the most extensive sand dune system in New Zealand called Masons Bay where you get to walk on along this fantastic 15km coast line. After your trek lunch is had on the southern coast featuring fresh locally sourced food and refreshments. From here you will be flown right around Stewart Island seeing all the wonderful sights Rakiura has to offer. You will land in the township Oban and given a personal tour around the township seeing all the local sights. From here your Journey will take you back over Fiordland though the Takitumu Mountains back to Fiordland lodge. Experience Fiordland from every angle with an action-packed day of trout fishing, jet boating, hiking and a scenic helicopter flight. With this package, you’ll fish and jet boat the mighty Waiau River, fly over the Fiordland National Park and hike a section of the famous Kepler Track –incredible locations all right on the doorstep of Te Anau. Enjoy the grand landscapes Fiordland is famous for by water, air and land, all in one unforgettable day. Jet Boating + Fishing - Begin with being collected from Fiordland Lodge and a morning on the mighty Waiau River. Try your hand at fishing for Rainbow or Brown trout and soak up the thrill of jet boating alongside the Fiordland National Park. Then a pick up riverside for your Scenic Helicopter Flight. Soar high above breath-taking lakes and mountains on a scenic helicopter flight, enjoying a special landing in a remote alpine location. After being dropped at the Luxmore Hut, perched high on Mount Luxmore, a delicious picnic lunch is included. Then time to Hike the Famous Kepler Track. Lace up your walking shoes for an afternoon of hiking - this three-hour guided nature walk follows a portion of the famous Kepler Track. Limestone bluffs, incredible views and lush forest sections make this walk truly unforgettable. Once you have made your way down to Brod Bay you journey back to Te Anau via water taxi before returning to Fiordland Lodge. Your Epic Fiordland fay out includes transport to and from Fiordland Lodge, fishing licenses, delicious home baking for morning tea and a picnic lunch. Pricing $995 per person, extra people $570 per person. Minimum number 2 people, maximum number 6 people. Heli-hiking, gives you the freedom to get the sort of perspective on nature you've only ever seen on documentary films. 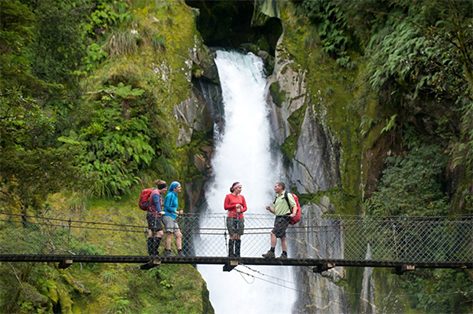 The Kepler track is the most assessible and closest Great Walks hike from Fiordland Lodge. 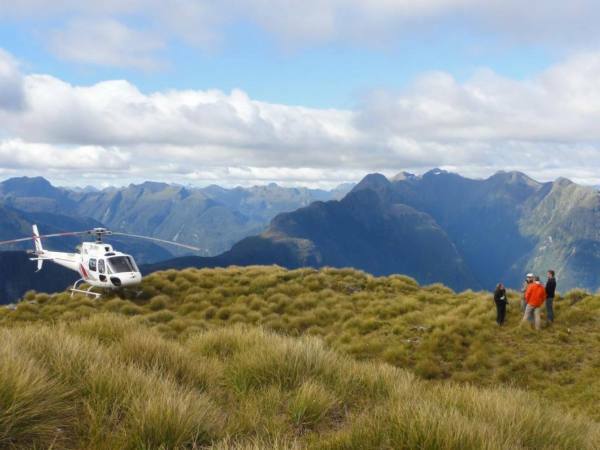 An amazing experience is to combine a walk on this New Zealand renowned track with a heli hike. Begin your Kepler Track guided heli hike with a spectacular Scenic flight by helicopter directly off the lodge lawn, over the hidden lakes and beech forest of Mount Luxmore to arrive at the Luxmore Hut. After your helicopter ride you arrive at the Luxmore Hut, the first hut on the Kepler Track Great Walk. With your knowledgeable, local, nature guide, learn about the fauna and flora in the surrounding alpine tussock fields, and enjoy the panoramic views of the Te Anau basin, scenic lakes and surrounding Fiordland Mountains. After time exploring the alpine area, the opportunity is to walk to the summit of Mount Luxmore, and enjoying a true wilderness tea break. The trip from the Luxmore hut to the summit of Mount Luxmore is approximately 2-hours return up-hill from the Luxmore hut. Then...descending through magnificent mountain and silver beech forest the effects of different altitude and weather conditions experienced in Fiordland are clear to see, as the trees and undergrowth quickly change, creating a varied backdrop for your hike. Half way is marked as we pass under magnificent towering limestone bluffs allowing the guide to share the geology of Fiordland with dramatic visual examples. The approach to Lake Te Anau is evident by the track meandering through native New Zealand ferns and other sub-tropical species. Your guide will share local conservation efforts on the Kepler Track and demonstrate a stoat trap, a tool used in controlling these introduced predators which can decimate our native bird population. The hike is finished at the sandy beach of Brod Bay, the pick-up point for the boat cruise back to Te Anau township. 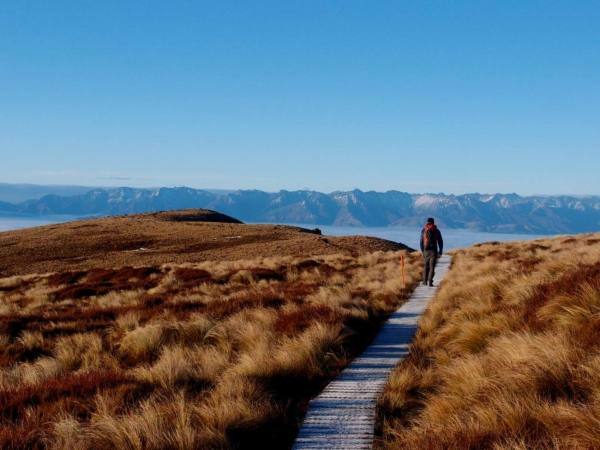 The boat ride offers an enjoyable way to complete this amazing and very beautiful guided walk on the Kepler Track, offering good viewing of your path, from alpine area to the clear water of Lake Te Anau. You will be met from your boat ride and returned to Fiordland Lodge. If you do not climb to the summit this is an easy downhill walk (8km) requiring a medium level of fitness. There are plenty of stops for photographs, bird-watching and interpretation along the way to break the descent. There is plenty of opportunity to learn about the natural and human heritage of mighty Fiordland. Your experienced guide will carry all safety and communication equipment to ensure your wellbeing on the guided walk. Comfortable walking boots/shoes, waterproof jacket, warm clothing including hat and gloves, sun screen and sun hat, camera, lunch (if not pre ordered), water bottle, day pack, personal medication if required, and insect repellent. Walking poles are optional. Allow up to 5 hours, group size maximum 12 people, fully guided walk and average fitness required. Departing Fiordland Lodge at 6.30am with your private guide and vehicle you start by travelling the world’s most scenic highway towards Milford Sound for your 1st GREAT walk “The Milford Track”. Departing from Milford Sound you begin with a short boat ride to Sandfly Point and here the Milford Track meanders alongside the cascading Arthur River through lush rainforest to Giant Gate. This spectacular waterfall (pictured below) is best viewed from the large swing bridge spanning the river. Soak up the grandeur of the world-famous Milford Track from the ancient canopy trees towering above to the emerald-green ferns below and the birdsong that echoes through the trees. This New Zealand Great Walk is suitable for all abilities and there is much to see, walking is at an easy going pace and your personal nature guide will point out the native plants and birds inhabiting this lush environment, and share the track’s stories, bringing the history of the area to life. Walking Distance 11 km, mainly flat track with 30 metre gain in height. Arriving back at Milford Sound for approximately 1pm your helicopter is booked to lift you for a scenic flight of Milford Sound taking in Sutherland Falls, Mitre Peak, and towering ice capped mountains. Approximate flight time 1.5 hours. 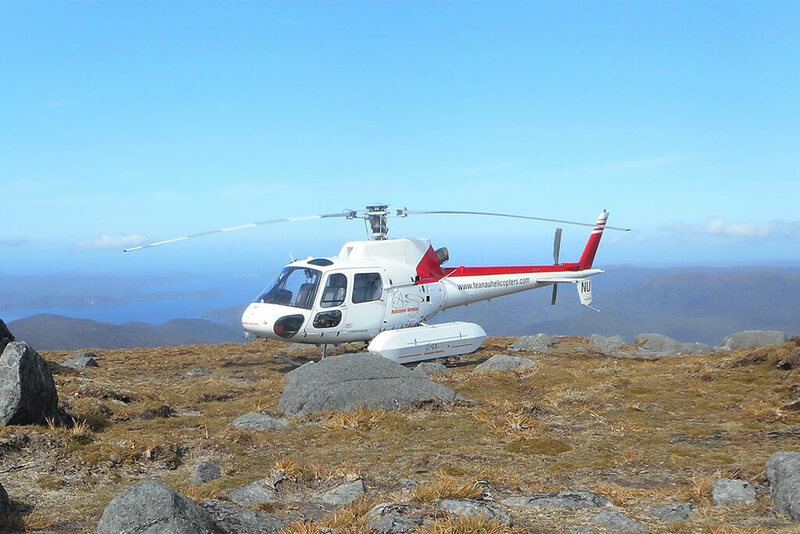 This flight is a real highlight of the day and on your return helicopter journey we will take you back towards Te Anau along the Murchison Mountains, a special conservation area paramount in the management of the endangered flightless Takahe. The start of your 2nd GREAT walk begins with a helicopter drop off at the Luxmore hut (1085 meters above sea level) the first stop on the Kepler Track and the starting point for your 8km walk. From the hut you can enjoy the panoramic views out over the Te Anau basin, scenic lakes and Fiordland Mountains before descending through a magnificent silver and mountain beech forest where you will experience the changes in vegetation as you descend through the altitude to your pick up point at Brod bay. From the sandy shores of Brod bay we transfer you back across Lake Te Anau to the town ship of Te Anau through boat an enjoyable way to complete this very beautiful walk. Price: $3075 based on 1 or 2 people (extra $1090 per person after 2 people) maximum 6 people. Includes all transfers, scenic helicopter flight, nature guide, picnic lunches, boat transfers and concessions. Very few people get to see Dusky Sound due to its remoteness. This is a great option for those who like to 'get off the beaten track' and are interested in the history of the area! Departing and returning from the Fiordland Lodge lawn, Dusky Sound is an incredibly beautiful, remote fiord made up of more than 350 small islands. It is one of the largest fiords at 40kms in length and is New Zeland's largest sound. This flight takes you over the picturesque Lake Manapouri and above the Kilcoy mountains before descending into Dusky Sound. A landing is made at Mt Pender, where we shut the helicopter down to enable you to fully experience the beauty and solitude of this special historic area. When airborne again, you fly over top of 3 more impressive fiords before descending into Crooked Arm in Doubtful Sound. Doubtful sound is about 12-15 times larger than Milford Sound and absolutely spectacular by air. While flying up this fiord you detour into a unique hanging valley known as Campbell’s Kingdom, complete with its own lake and waterfall. The return journey takes you aloft the Main Divide of the Southern Alps with a second landing at Mt Kidd, a remote alpine location with dramatic views. Enjoy this premier heli-flight experience. This grand-daddy of scenic flights takes you on a spectacular journey across the renowned Fiordland National Park. From sea level to mountain tops, this flight incorporates Fiordland's top three destinations, Dusky Sound-New Zealand's largest fiord, Doubtful Sound and the iconic Milford Sound. This fabulous flight departs and returns from the lodge lawn. Flying by helicopter enables you to see so much more, including remote hidden valleys and spectacular coastlines. Three landings are made on this trip, and you may like to take lunch or refreshments with you to enjoy at one of the landing locations. Simply put, it's the Ultimate Fiordland Experience! 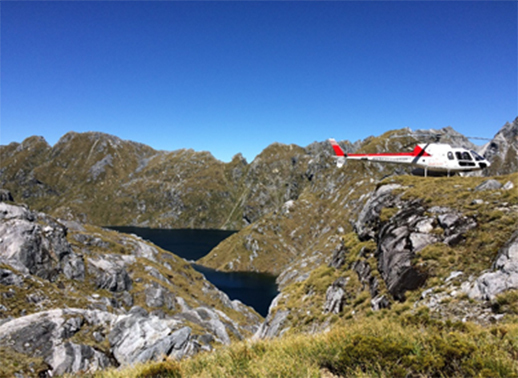 The "Sights of Southern Fiordland" flight provides a unique opportunity for clients of Fiordland Lodge to experience this wilderness from above as well as on the ground. You will be picked up from the Fiordland Lodge by helicopter at 10am. From here you will fly westward to the Tasman Ocean and then south along the coastline and outlines of Doubtful, Dusky and Chalky Sounds. Preservation Inlet is the southernmost of Fiordland’s fiords and Puysegur Point is the site of one of New Zealand's most famous and remote lighthouses. The helicopter will land here so that you can explore this area on foot with a local and knowledgeable guide. After this walk you will be flown to the only privately owned Lodge in Fiordland for a lunch featuring fresh locally sourced food and refreshments. After lunch your aerial exploration of southern fiordland will continue. Alpine and waterfall landings will add another dimension to your day and we can quarantee you will be amazed by the variety and scale of the landscape. Your flight will finish at 4pm when you are dropped off back at the Fiordland Lodge. This one-day kayaking excursion is a magical way to experience the stillness of Doubtful Sound and to appreciate the scale of the surrounding mountains. With helicopter flights to and from Deep Cove you are transported straight into the heart of this remote area of Fiordland. 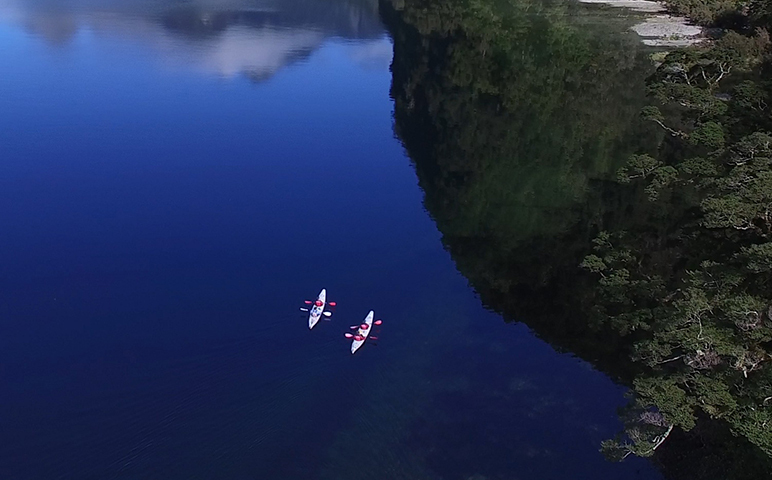 Explore the sheltered coves and shorelines of Doubtful Sound by kayak with your tour guide and at the end of your adventure you will be transferred back to Deep Cove by boat, ready to experience Fiordland by air as you return to Te Anau. A gourmet picnic lunch is included and all kayaking gear. NB: As the kayak cockpit is a fixed size, to ensure customers will “fit” into our kayaks we must impose a weight limit of 115kg. Children 14 years minimum age – children must have kayaked some distance before. Each child must be traveling with a strong adult (as they will be in a double kayak with parent) and be at least 1.4 meters tall and at least 45 kg in weight. With the private charter and customers flying in we are pretty flexible with times but often the mornings are the best time in terms of wind strength. Departing from Deep Cove between 9.00am and 1.00pm are preferable. The kayak is in one direction and the boat trip back is around 30 minutes. What to bring: Bring a warm, waterproof jacket, comfortable soft shoes, warm socks, swimwear for under wetsuit (provided), towel, insect repellent. Camera at own risk. Water bottle and a set of dry clothes. Price: $9,408 based on 1-6 people. Includes all transfers, nature guide for the day, picnic lunches.